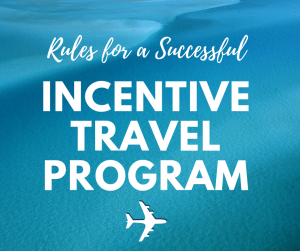 Rules for a Successful Incentive Travel Program | HPM Associates, Inc.
Do you want to light a spark under your employees and get them to work harder than they’ve ever worked before? One way to do it is by creating an incentive travel program for them. It’ll give your employees something to work towards, and as a bonus for you, it should lead to larger profits for your business and more productivity within your company. Before you can establish a travel incentive program, you need to figure out exactly what your goals are for it. Do you want to inspire your employees to work harder? Do you want your company to experience unprecedented growth? Do you want to entice more customers to work with your business? By creating goals, you can determine what you want your incentive travel program to accomplish. It’ll help you see how successful it was (or wasn’t) later. Once you’ve created goals for your incentive travel program, it’ll be time to come up with rewards that you’re going to offer your employees as part of the program. The rewards you select need to be exciting enough to fire up your employees and motivate them to want to win the rewards. Otherwise, they might not be any more motivated than they are now, and your program won’t help you achieve your larger goals. Regardless of what your overall goals are, the challenges you set forth in front of your employees as part of your travel incentive program shouldn’t seem insurmountable to them. If they do, they may not be motivated to take on the challenges. Even worse, they might feel like you’re setting them up to fail by asking them to take part in an incentive travel program where the goals seem unattainable. At the end of the day, you’re making an investment when you come up with an incentive travel program. You’re agreeing to spend money on incentive travel in exchange for your employees helping you meet certain goals. Your investment needs to make sense and you need to come up with a way to measure ROI. You don’t want to end up losing money because of your program, even if it does help you reach your intended goals. Would you like to learn more about how an incentive travel program can benefit you and your company? Call HPM Associates at 305-274-0030 today to see how incentive travel programs work and how they can be used to motivate employees and, in some cases, even loyal customers.